China may be quick on the path to constructing the world's newest tallest building ever, but should they succeed, their reign is probably going to be fairly short-lived—and all because of an elevator. More specifically, an elevator that can travel up to 1000 meters—two times higher than any built before it. Can China Really Build the World&apos;s Tallest Building in 90 Days? Developed by Finnish manufacturer KONE, a new hoisting technology called UltraRope makes these previously unfathomable heights possible. 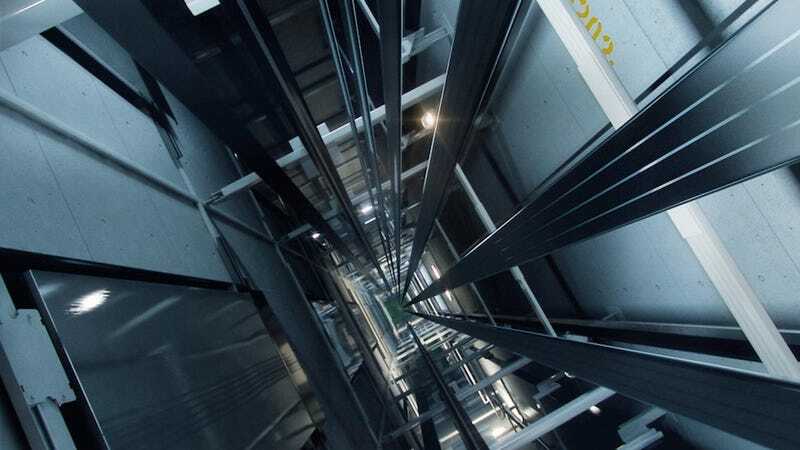 While most modern elevator systems employ steel rope, UltraRope consists of a carbon fiber core (making it incredibly light) surrounded by high-friction coating. Because this new rope is so light, not only does it cut down on energy consumption, but it also reduces the weight of virtually every moving component: the hoisting ropes, compensating ropes, counterweight, elevator car, and even the passenger load itself. But the benefits don't just revolve around weight, according to KONE, "Carbon fiber resonates at a completely different frequency to steel and most other building materials." This minimizes elevator delays that are otherwise caused by a building's natural sway. Plus, the rope can last twice as long and doesn't require any lubrication for maintenance.